The delegation of Buddhist monks from Sri Lanka Wednesday said they found Pakistani people peace-loving, hospitable and generous which is different from what international media projects. Speaking at the concluding ceremony of ‘Vesak Mela’ celebrations arranged by National History and Literary Heritage (NH&LH) Division, the Buddhist monks said, “The hospitality, love and respect shown by Pakistani people won our hearts”. “Preservation and maintenance of our sacred places by the officials is evident of the level of respect Pakistan has for our religious beliefs”, they said. A delegation of around 40 buddhist monks and visitors from Sri Lanka headed by Professor N Gnanaratana reached Pakistan on Sunday to attend ‘Vesak Mela’ celebrations. 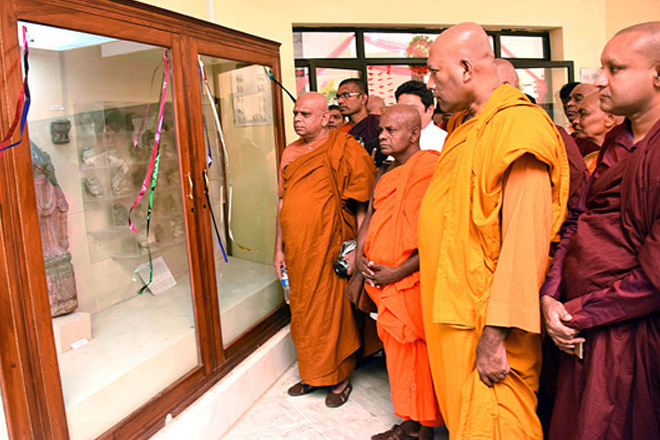 The Buddhists monks visited sacred places in Taxila and Takht Bai along with the officials of NH&LH Division to perform their religious rituals and departed for Sri Lanka after the concluding ceremony on Wednesday. The officials of the division briefed the monks about the historical significance of these places. Talking to APP, Head of Sri Lankan Buddhist monks’ delegation, Professor N Gnanaratana said, “Pakistan is a real friend of Sri Lanka who always stood with it in conflicted situations, natural calamities and every hour of need which the whole Sri Lankan nation acknowledge and admire”. He appreciated the arrangements made by the officials of NH&LH Division for their visit to the Buddhist spots and said both the countries have many cultural similarities and great love and respect for each others religions. He said, “Pakistan is true friend of Sri Lanka and this is not only the observation of Sri Lankan government but the ordinary people also think in this way”. He said, “Whenever there is any debate or issue at international forums, Pakistan has always raised its voice in favour of Sri Lanka”. The female Buddhist monks including P Dhammanande, M Seelapriga and A Summanaseeli, they said, “We came to Pakistan for the first time and received great respect and love from not only the officials but also local people of the Buddhist sites. They said, “We are impressed with the arrangements of this festival in Pakistan, warm welcome by the officials and hospitality of Pakistani people. It is just like we are at our second home”. High Commissioner of Sri Lanka for Pakistan, Maj General ® Jayanath C P Lokuketagodage thanked the Advisor to Prime Minister on NH&LH, Irfan Siddiqui, Federal Secretary, Engineer Aamir Hasan for arrangement of ‘Vesak Mela’. He hoped that next year Buddhists from other countries will also be the part of Vesak celebrations. The Vesak day is celebrated to commemorate events of significance to the Buddhist of all traditions: the birth, enlightenment and the passing away of Gautama Buddha. The Vesak festival, also known as Buddha Purnima (full moon) and Buddha Day, is a holiday observed traditionally on different days in all Buddhist countries of Asia and other parts of the world.